Bif Bang Pow! 's incredible line of fully articulated action figures grounded in Rod Serling's enduring The Twilight Zone TV series rolls on with this replica of the Gremlin. 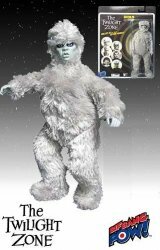 The weird fur-frocked gremlin right out of the 1963 The Twilight Zone episode titled "Nightmare at 20,000 Feet" and starring William Shatner, this action figure is sure to give the heebie jeebies to anyone who's already afraid of flying! Designed in a retro 1970s style with fabric clothing and multiple points of articulation, Gremlin stands 8 inches tall. Whether a flight across country is planned or not, you're going to want this incredible figure in your Twilight Zone collection! Each figure comes individually carded in blister packaging. Ages 14 and up. Collectors Note: Brand-new, factory sealed. The very top of the backing card on this item was folded over in shipping from the distributor.